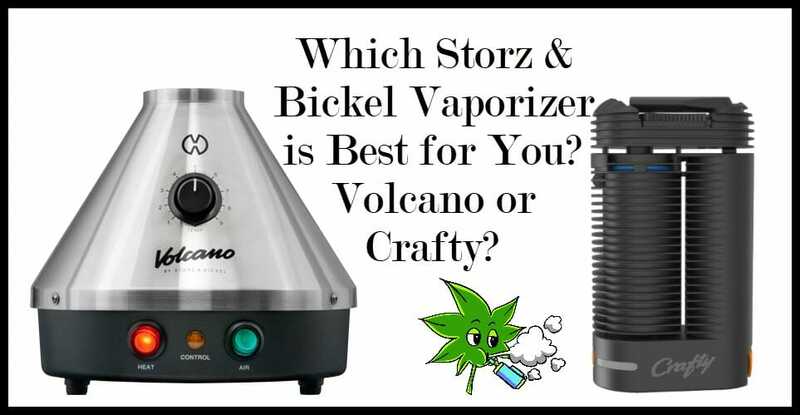 The Volcano Vaporizer manufactured by Storz & Bickel, based in Germany, is the leader in the vaporizer industry for several reasons. This product has set the mark for the industry with the durability, quality, and workability of the unit. The vaporizer is a lot higher in price than most of the comparable units on the market, and at $500 to $600, for the average vaporizer user, it just seems too high in price. On the other hand, users who have owned the product for any length of time tell us that they would not think of purchasing any other brand of a vaporizer. 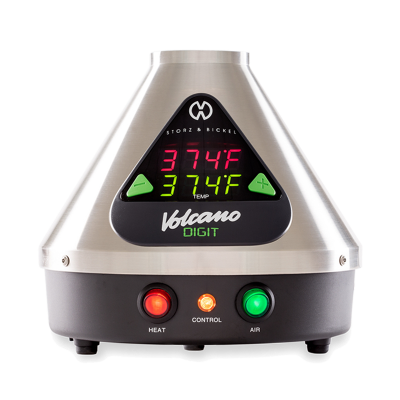 I found a better deal than most online venues and you can find the link at the end of this Volcano Vaporizer review. 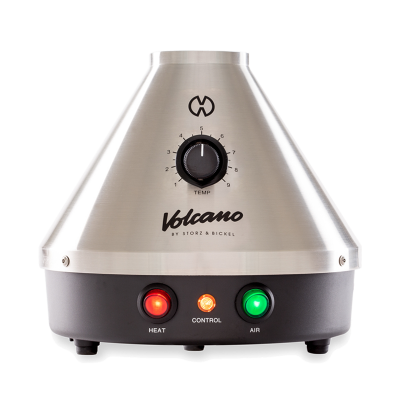 What Are Volcano Vaporizers Used For? Vaporizers are primarily used to moisten the air in environments where the atmosphere is very dry. Such as in a desert area, or if people have to spend a great deal of time indoors where the air can get dry in a short time. In recent years, vaporizers have been used in aromatherapy and as a means of delivering medication to a patient with lung disease. The Classic model uses a dial that allows the user to set the desired temperature of the unit, which shows levels of 1 through 9. The temperature range is extensively explained in the clearly illustrated manual that comes with the unit. According to The Storz & Bickel website, the temperatures range from 266 degrees F and 446 degrees F.
The Digital model has an easy to read, very large LED display with large green “+” and “-“ buttons to adjust the temperature. The digital temperature will display on the LED quite adequately, as it can be easily seen from across the room. This is a very convenient way to see what is going on with the temperature especially if the room is dark. 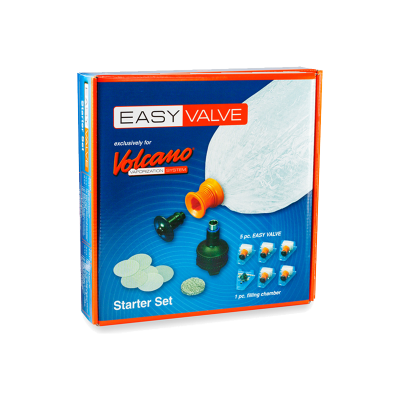 Both models offer the choice of using either the Easy Valve or the Solid Valve balloon technology. The Solid Valve version is very durable and reusable, and there are several different sizes of the balloon from which to choose. It is less expensive than the Easy Valve model, but you will have to take it apart and clean it every so often. The Easy Valve model automates everything in the cleaning process so you don’t have to lift a finger in the way of cleaning because this model has a pre-set balloon. A savings can be noticed by purchasing the Solid Valve setup because over time money is saved. As the balloons can be purchased separately, whereas, with the Easy Valve, the balloons have to be replaced along with the valve. It is nice to have this choice because different people will have their own preference. To operate the system you just push the valve in right next to the balloon The unit releases the vapor to be inhaled. The filling chamber is of a good size. It serves to have enough room for hot air from the chamber to circulate and properly heat the vapor as it evacuates from the unit. People who take medication with the vaporizers report a much more invigorating treatment experience simply because of the quality of the vapor itself. It seems to get into deeper recesses of the lungs. The vapor is very clean and free of tar and is produced at a very steady rate, which can be depended upon to continue its dependable service. Longtime owners of the Volcano say that they don’t know how it would have been possible to get along without the Volcano. As the vapor that comes from the unit is really top-grade. It is steady, clean and uniform. This is the most adequate answer that is given when people question the price because after the unit is used over a period of time, the price objection is usually never mentioned. The Volcano is especially good for individuals with lung diseases, because of its reliability. You can always count on a steady flow of the vapor as it pours out of the unit. You do not need to clean the Volcano as regularly as other brands. When it does need cleaning, it is easy to do. The patented technology of the unit places beneficial flavors and aromas into the vapor from a balloon that injects it through a valve into the surrounding air. There is not another vaporizer on the market that can combine the delicate airflow mixed with the vapor in order to deliver this soothing and healthy combination. The Volcano is extremely sturdy and does not seem prone to malfunction or breakage. It can run effortlessly all of the time without missing a beat and is easy to maintain and clean. Users report that the solid valve model seems to be less apt to break. It works all the time and only takes about one to two minutes to heat up. Even at the highest heat setting, there is no heat transferred to the outer casing, thus making it easy to leave it on all night. 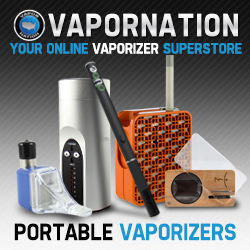 If you are looking for a top of the line vaporizer, you have found it. This product will be with you for the rest of your life because there are very few moving parts. The Vaporizer does have a 3-year warranty. The concern in regard to its performance is a minor issue, because of the high quality of the unit, and from the reports of many users, there is almost never a complaint about its durability or length of the performance. If there is a needed repair, it will be done free of charge if the defect is the result of a part or manufacturing error. If the problem is caused by you, such as you dropping the unit, the company will create an estimate of the fixing and repair the Volcano as soon as you agree to the estimate. 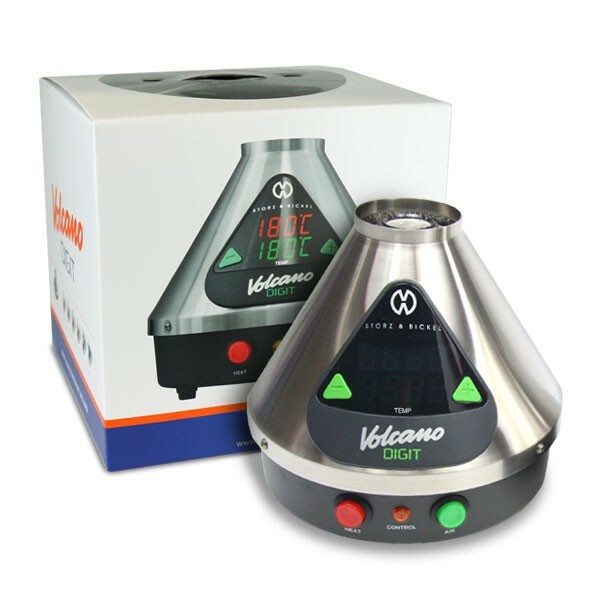 You can get this Volcano Vaporizer at VaporNation for the best deal. If I can find someone that can fix it I will let you know. Thank you for this great review of the Volcano Vaporizer. I had not heard of this product before. I use vaporizers at the moment mostly for aromatherapy and other essential oils. I prefer to use electric ones instead of candles due to the risk of fire. I can see how this machine would deliver clean oxygen which is steady, clean and uniform. I like the way that there is no heat transferred to the outer casing. This is good to know in case kids or pets knock it over accidentally. I was just wondering which feature or benefit you like the most? Glad you liked the review. The thing I like best about the Volcano Vaporizer is how precise and quick the heating up is of this unit. Both the analog and Digital versions are fast to heat up and you can adjust the temperature right where you like it with ease. The shape also keeps it from knocking it over like you said and that is nice because I can be very clumsy at times.